Tokyo Game Show is currently underway, bringing with it a wave of news related to Japan’s top gaming IPs. A wave everyone’s prepared to ride under normal circumstances, but that got a bit derailed by an unexpected announcement: The [email protected] franchise will see a brand new theatre branch added to its ranks in 2018, as an addition to the current 765AS (original flavour), Cinderella Girls, Million Live, and SideM. This has once again sparked the arguments on why won’t Namco simply focus on Million Live and give it an anime adaptation, which are plagued with misconceptions about the anime industry and how these creators in particular operate. So, leaving strong personal feelings about the franchise away for a moment, let’s clear up the situation regarding Idolmaster‘s staff. Nishigori’s name may stick out most here as he was the director of the original 2011 Idolmaster, but he’s not actually the focus in this instance; he’s voiced his desire to step away from key roles in the franchise’s future adaptations in order to let newcomers properly follow their own vision, so even taking into account that Million Live involves his original cast, it’s hard to imagine Nishigori having much of a role in its eventual anime. Instead, it’s Akai’s name that raises the most suspicious flag, as he’s one of the most important members of the imas crew at the moment. These are the people who have mostly been working with the franchise ever since Animas, moving onto the movie and eventually the Cinderella Girls adaptation together, becoming such a tight-knit group that they would often reunite on other projects such as Vividred Operation and Occultic;Nine. Among them are names like Megumi Kouno, Isao Hayashi, Jun Uemura and, of course, Akai himself. It’s this very crew who delivered the – rather spectacular, if you don’t mind some personal bias – 4th anniversary PV shown at Budokan earlier this year, after a few months of silence following the end of Occultic;Nine. The fact that Akai is now serving as a key player in Darlifla while almost everyone he worked with on that PV have yet to surface since its release feels like more than just a coincidence; if they’re hiding anywhere, it’s likely to be on this project, alongside a significant part of that crew. But not all of them, of course. I’ve already detailed who among them have been allocated to SideM itself, but other notable examples include Yuusuke “Fugo” Matsuo currently working on an OVA and season 3 to the greatest show of all time, Ryouji Masuyama taking up his first role as series director on next season’s Blend S, and Yukei “UK” Yamada suffering to keep Fate/Apocrypha afloat. Following staff output and joining the dots together like we did just there is generally a reliable method of keeping oneself up to scratch with who might turn up where, but there’s times where we’re offered the luxury of making our predictions more precise. Certain animation producers can have heavy influence on who turns up on their shows; since we’re talking about this group of creators, look no further than when Megumi Kouno used to do so for at least one episode on almost any of Yosuke Toba’s shows. That said, few pull it off as well as A-1’s own Yuichi Fukushima. An unabashed imas fan at heart, he was still a Production Desk while working on the 2011 series, but he climbed the ranks to animation producer by the time Vividred Operation came about, then went on to handle all major projects related to the franchise: the initial Cinderella Girls PV, Cinderella Girls itself, both Million Live PVs, and now SideM. I mentioned both Vividred and Occultic;Nine as the two major shows where that crew reunited before, and it’s hardly a coincidence that both just so happened to be led by Fukushima as well. He’s no outsider here; he’s a bonafide member of said crew, essentially its leader on a producer level. Keep in mind that he’s the animation producer on Darlifla too, which gives us two important pieces of information: 1) his involvement raises the odds of people essential to Million Live’s creation being too busy at the moment, and 2) even if they weren’t, he himself is currently too occupied for it due to having both this and SideM on his plate. And since there’s no way someone else would be chosen to coordinate the project, it can’t happen yet. Simple, really. In short, the reason you likely won’t be seeing the Million Live anime anytime soon isn’t due to some odd bias against it, and it definitely isn’t because they’d rather chase the wallets of evil women ruining your cartoons. It’s far more straightforward than that: there’s simply no one around to make it right now. 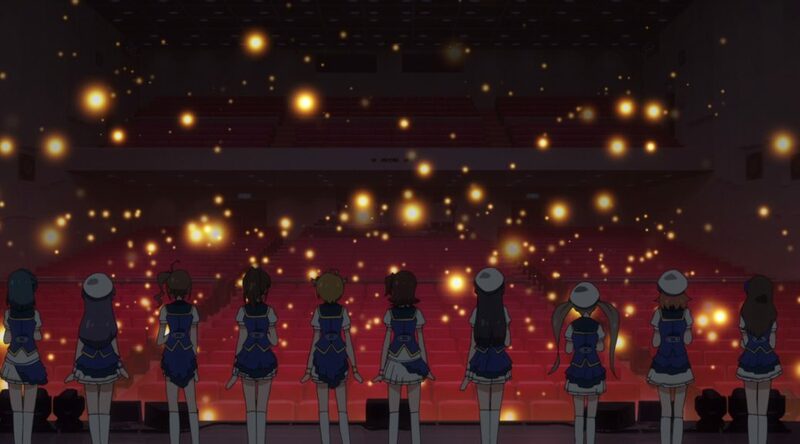 One of the reasons this franchise has consistently had high-profile adaptations, sometimes in spite of messy production schedules, is because it’s been supported by an immensely talented group of creators; even as the key staff is reshuffled, Idolmaster‘s production backbone has stayed the same, and that can only mean good things. So unless you want to get rid of that exceptionally skilled crew and settle for a monstrosity like Yutaka Yamamoto’s Million Live, just wait. Don’t worry, Scamco won’t miss the chance to milk your wallet too. I’m sure if DarliFra turns out good (and I certainly hope so, it has almost everything going for it) and popular it will work out better in the long term for any potential ML adaptation. Akai seems like the guy they’re keeping their eyes on for the director role and just rocketing him up from, admittedly good, a few episodes and two music videos to a full series wouldn’t have been a great idea. The assistant director role in DarliFra should give him both experience and recognition. You’re probably right in that it he was ready for the director position but it just feels right for him to direct ML after working as assistant director alongside Nishigori. Can’t blame you for being cautious, especially after the events of this week. I’d just like to believe that they understand why both Animas and Dereani turned out as well as they did in the first place and not make the decision to go ahead with it at the worst time. At the very least I don’t expect them to gather up absolutely everyone, but the staff’s love for the franchise feels like an important factor to consider in the grand scheme of things.